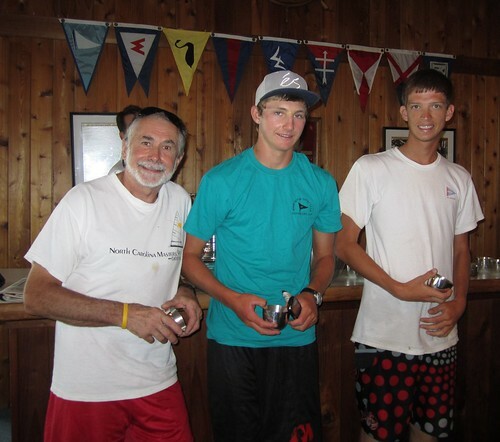 Jach Spracher (HYC) won Ware River Yacht Club’s Virginia Governor’s Cup Regatta in the 9-boat Laser Standard fleet. He was followed by Austin Powers (FBYC) and Alain Vincey (FBYC). The competitors saw windy conditions on Saturday, almost uncharacteristically windy for Ware River, and two races were sailed. On Sunday 3 more races were sailed in lighter winds. The racing was close and several sailors dropped spots by miss-reading the course board. Another highlight of the regatta were the fleet of 5 foiling moths also racing on the course. Rules: The regattas will be governed by the Racing Rules of Sailing and by the events sailing instructions. Fees: Registration is $30 for single crew classes and $40 for all two or more crewed boats. Regatta T-shirts are included in the registration fee for participants. Registration by mail or on the day of the regattas. Some of the anticipated One Design classes of 5 or more boats are: Sunfish, Albacore, Hampton OD, Buccaneer Laser, Mobjack, Mutineer, 505, Flying Scot, Frontrunner. Classes with fewer than 5 boats participating will be grouped with other such classes and race under the Portsmouth handicap system. (D-PN). Scoring: The Low Point system of RRS Appendix A2 will apply with the following modifications: There will be no throw-outs. One race will constitute a regatta. Governor’s Cup Regatta Awards: Trophies will be awarded to the top three finishers of all registered classes with 5 boats or more. The top three finishers sailing in the Portsmouth fleet will be awards trophies. The Governor’s Cup trophy is awarded to the winner of the one design class with the largest number of qualified starts in the regatta. The Congressman’s Cup trophy is awarded for sportsmanship throughout the regatta. The Chamber of Commerce Junior Cup is awarded to the top skipper less than 18 years of age. Other Information: Pre-Registration is encouraged. Printable registration forms will be found at www.wareriveryachtclub.com. A Saturday night fundraising dinner and social will benefit the WRYC Jr. Sailing program. Camping (no hook-ups) is available on site at WRYC. Hope all the Lasers will come and enjoy great racing and a great time. Let’s Go Sailing — Again we’ve planned a weekly evening series of “fun and informal” racing on the Ware River for WRYC and other local small boat sailors. New sailors can learn to sail their boats well and the experienced sailors can hone their racing skills. INTERSTED? Please read the info below and contact Rick Klein at 804-693-5629 or e-mail rgklein45@aol.com if you have questions. Pass this message on to anyone you know wants to come sail with us! Eligibility—Any sailor that wishes to sail. Non-Club members are encouraged to sail and are welcomed. Participants will be allowed to park their trailered boats on the Club property during the series. A Club boat storage agreement and Series registration must be completed prior to use of the Club grounds. Registration form is attached and required to sail. Junior sailors are welcome and will need their parent’s written permission. Juniors 14 and under will require on-site parental supervision during the series. Parents/Spouses of sailors are welcome to bring a picnic supper and watch the great sailing going on. Gas grills are available for use. Even come sail with your Junior/Spouse – You may enjoy sailing too! Club Boats – Use of Club boats by CLUB MEMBERS is encouraged and will signed out on a first come first served basis. (Starts – First warning – 1820 (6:20 PM) – Using Sound-Signal Starting System (RRS Appendix Q). Courses – Windward (Upwind)– Leeward (Downwind)in configuration. At least one race each evening.